Tweaking the focus and the price, 2016 Leaf Cut Signature Edition trading cards return with a revitalized design. Each box guarantees one cut signature card. Even though Leaf produces several cut autograph products, many focus exclusively on a specific sport or athlete. 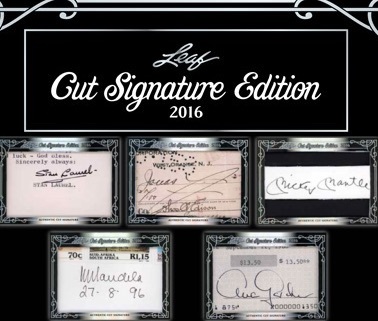 However, 2016 Leaf Cut Signature Edition encompasses an eclectic mix of subjects for autograph enthusiasts. While the full checklist is not known, the early list does resemble the variety found in 2015 Leaf Super Cut Signature Edition. Short and sweet, collectors can find one slabbed Authentic Cut Signature card in each box. Every cut signature card is serial numbered and has a silver, almost metal-like border with an ornate design. While the set promises a lower price point, the overall rarity remains with only 100 numbered cases of 2016 Leaf Cut Signature Edition produced. When did Chatkes Barkley die.